Welcome to Fall and the approach of the family wonders of Thanksgiving and Halloween, folks! The Toy Soldier reached its apex in 1963 with the issuance of a brand new size from Marx, the “HO” scale figures, released in boxed sets as Marx Miniatures. 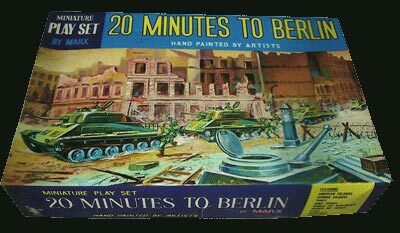 They were at first “Hand decorated by Artists,” then, as acceptance grew Marx grew bolder and they became “Hand painted by Artists.” There was a huge variety of these but some of the most popular recreated the battles on European soil, the so-called “European Theater” playsets: Battleground, Invasion Day, and the evocatively named Twenty Minutes from Berlin, suggesting the nearness of the end of the war and a complete victory. Here in one big issue are the boxes, the vehicles, the figures and tiny accessories that made these sets so charming. There was something enigmatic about their smallness combined with the ferociousness of the subject that give these sets their incredible popularity among a large range of collectors. Here at PM, Kathy has fallen in love with these tiny treasures and insisted the publication do a “full meal deal” job on these sets. Mike Jason, owner of several boxed mint sets (the best way to do a contents list) liked the idea and threw in with us to the point that he actually opened several sets to get the particulars reported right here. Going to the other extreme, we also touch on some rare 6” figures we have dubbed “International Soldiers,” showcased for us by Mark Hegeman, the premiere larger scale collector. One of the most unusual makers was Giant, who is captured in a rare moment of whimsy this issue with “Daniel Boone In Ol’ Kentucky,” an article showcasing a beautiful little set called “Daniel Boones’ Journey to Kentucky” which features six wagons, a slew of Pioneers, and Indians. 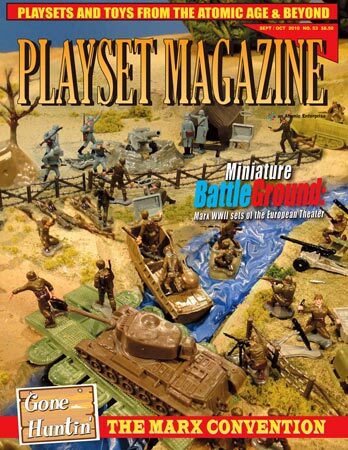 There are brand new reviews, too, as Paragons Battle at Apache Pass is featured. This fine new offering is thankfully in the scale of the TSSD figures, and offers new terrain for the famous battle to take place on. We give a great look at the new figures, too – brand new 7th Cavalry and Apaches. Plus there are some dandy ads offering some terrific vintage toy soldiers and playsets and looks like our free-to-subscriber” classifieds are plum full too giving some dandy browsing time to readers, and all our favorite advertisers are here with some tree-mendous offerings as we build up to the next issue (and final one of the year) Strategic Air Command. This set is a particular favorite of the publishers, with its roaring U.S. Air Force jets, its thundering B-52 long range bombers, rare tine litho, and especially rockets -- so expect a real special effort to make a classic Christmas issue, one that you’ll treasure as we get into the holidays.